At the beginning of his turn, he boosts himself slightly. * Eventually, the boost increases greatly. ** After this happens he no longer receives any periodic boost. Immunity to the old versions of Freezing and Paralysis. If it occurs often enough, you cannot act and skip your turn+++. At the end of his turn, he can skip your turn and attack again. He can do this repeatedly, so that he attacks (e.g.) a half dozen times in a row. When he attacks, he heals himself. 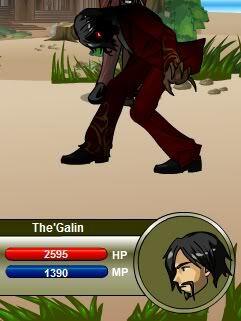 *The`Galin grows weary of this game and increases his power! **The`Galin is finished toying with you! ****The Cold tears through your body and mind! +The`Galin has shown mercy and spared you from the Cold?! ++Your weapons and spirit are heavy, but you fight on! +++You can't possibly win. What's the point in fighting? Communicant of the Devourer The'Galin, Ryuusei Cartwright became Omega, the vessel in which the Devourer has manifested! Thanks to UZ the Ebil, Saojun, fenmeisterkronos, and Monu. PWD from Void Dirger. Correction by Scakk. New image from Windy. Third gold/XP from 1stClassGenesis. Immunity correction from docdocdoc01.